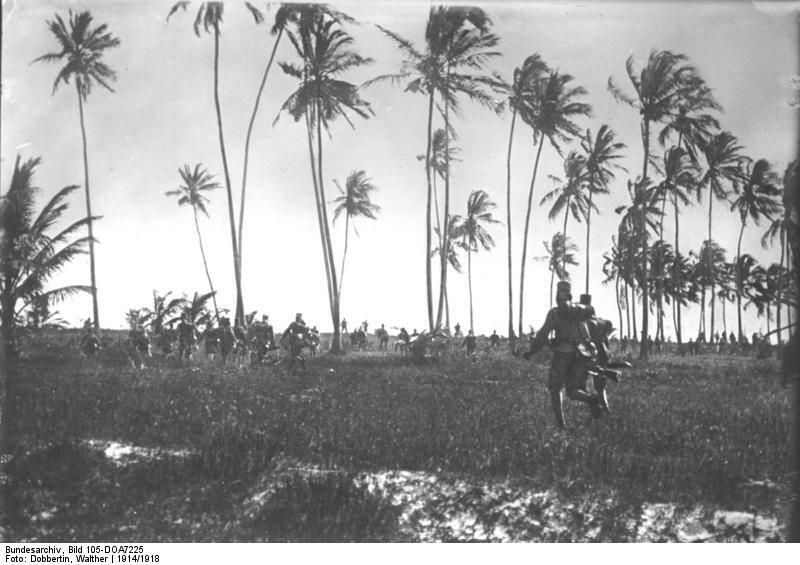 The British are attacking Tanga in German East Africa. They have landed a mainly Indian force outside the town and are now advancing to take the port. The German defenders comprise a few European settlers and a much larger number of locally recruited troops known as Askaris. The British outnumber the Germans 8 to 1 but the fighting does not go their way. The bush terrain outside Tanga is not what their soldiers had been expecting. The attackers find it hard to make progress. Some of the British make it into the town but are then involved in tough street fighting. In the late afternoon the tide turns against the British. First a swarm of angry bees attacks and routs an Indian regiment. Then more German reinforcements arrive by rail. German commander Lettow-Vorbeck commits them to a flank attack. Despite their massive numerical advantage, the British break and flee back to their landing place. The battle is now over. The British return to their ships and sail away, leaving behind copious amounts of guns, ammunition and equipment for the Germans. Germany has a number of colonies in Africa. Isolated from the homeland, they should be easy pickings for the Allies, but they have proved surprisingly tough nuts to crack. Togoland was easily overrun. In Kamerun the Allies have made some progress but the Germans there are continuing to resist. And in South West Africa, a British and South African invasion force has been soundly defeated. Now the British decide to have a crack at German East Africa. Rather than attempt an overland invasion from British East Africa, they decide to assault the colony from the sea. A small naval squadron brings Indian troops to attack the German port of Tanga. But the Germans refuse a call to surrender. Fearing mines, the British do not attempt to force a landing directly into the port. Instead they begin to land troops on a beach a few miles outside town. There are in fact no mines in the harbour at Tanga and the port only has a handful of African Askari troops defending it. While the British land their forces, the Germans rush in whatever troops they have available by rail. With them comes the commander of German military forces in the colony, Paul von Lettow-Vorbeck.